For more than two decades InspecTech Aero Service, Inc has been a source for the Aerospace Industry providing Aircraft System Design and Certification, Research & Development, Prototyping, Supplemental Type Certificates, Parts Manufacture Approvals and Original Equipment Manufacturer. Due to demand IAS now offers its line of "Smart Products" to the Marine Industry. 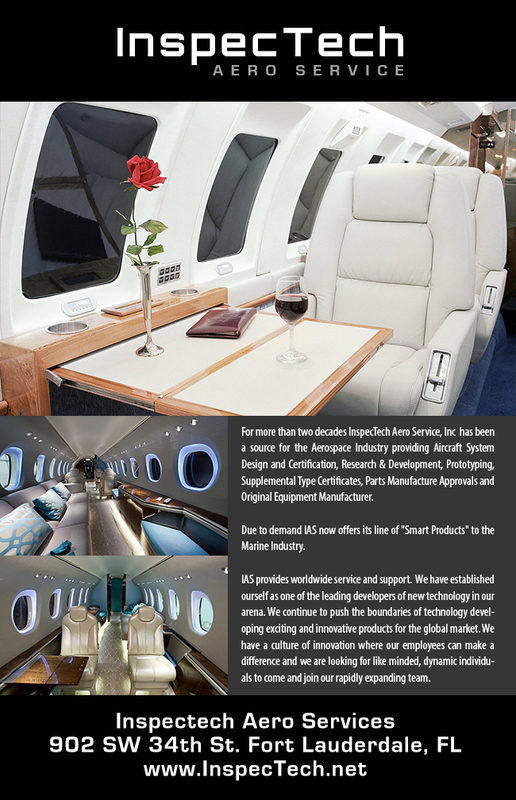 IAS provides worldwide service and support. We have established ourself as one of the leading developers of new technology in our arena. We continue to push the boundaries of technology developing exciting and innovative products for the global market. We have a culture of innovation where our employees can make a difference and we are looking for like minded, dynamic individuals to come and join our rapidly expanding team. To learn more, please visit www.inspectech.net.